The attendance of a large colour party at the funeral procession of republican socialist matriarch Peggy O’Hara last weekend has outraged politicians and encouraged the PSNI to make a number of provocative raids, including at the home of the dead woman’s grief-stricken family. Mrs O’Hara, mother of INLA (Irish National Liberation Army) hunger striker Patsy O’Hara, died at Derry’s Altnagelvin hospital last week. As her remains were returned to her home last Wednesday, an INLA Volunteer fired a volley of three shots over her coffin in a traditional republican rifle salute. Unionist politicians reacted furiously, with the DUP’s Nelson McCausland demanding that the PSNI mount an evidence gathering operation at Mrs O’Hara’s funeral. In response, the PSNI set up powerful cameras to train on the funeral cortege which was led by six women dressed in white shirts with black ties. They were followed by a colour party of 45 men walking in three columns, each dressed in INLA uniform. A horse drawn hearse bore Mrs O’Hara’s casket draped in the Irish Tricolour and the Starry Plough of the republican socialist movement and led by a lone piper in scenes reminiscent of her son’s funeral. Following Requiem Mass at St Columba’s church, Long Tower in Derry, the cortege moved to Bishop Street and stopped close to the home Mrs O’Hara originally shared with Patsy, where the colour party knelt briefly. The funeral concluded with the playing of the Irish national anthem. However, it was the apparent sight of numbers of INLA Volunteers, an organisation which declared a ceasefire in 1998 and decommissioned its weapons in 2010, which mostly infuriated unionists. 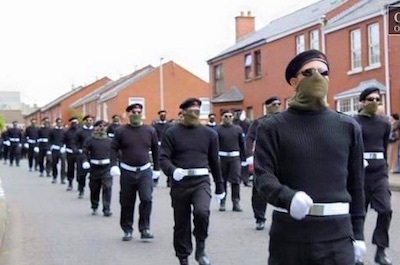 East Derry MP Gregory Campbell said the colour party had been “dressed in paramilitary garb with faces covered and were free to march, for almost two miles, around the streets of Londonderry”. He said the funeral scenes were “dangerous” and demanded “urgent statements” by the PSNI to explain the operation against what he described as an “illegal parade”. The family of Mrs O’Hara have defended the funeral, saying Peggy had organised it before her death. Edel Kelly told the BBC that Mr McGuinness had been told to stay away. “I’m just speaking from my granny’s point of view because I knew what her feelings on Martin McGuinness were,” she said. “He’s actually disrespecting her as the mother of a hunger striker. “It’s something that my granny wanted. If he’s condemning that, then he’s condemning the wishes of my granny. Ms Kelly also defended the military-style display of the funeral and said her “granny organised everything herself before her death, she wanted what happened at the wake and she wanted what happened at the funeral”. “She meant the world to me, to my sisters and my brothers as well and to a whole lot of people in Derry, because everyone knew Peggy O’Hara,” she said. In one of two orations, IRSP member, Martin McMonagle said Mrs O’Hara had been an iconic figure to the republican socialist movement. Mr McMonagle said the Derry woman had maintained “a fire in her belly” all her life in her opposition to British rule. “Peggy took an active role in the armed struggle and we support her for that,” he said. In the second oration, republican socialist veteran, Tommy McCourt said Mrs O’Hara was a “strong, honest and decent Derry woman.” Mr McCourt said that on the night of her son’s death, Mrs O’Hara came under huge pressure to end the hunger strike. “Peggy, with the love of her son on one hand and the love of her country in another, staggered between whether to intervene or whether not to intervene and Peggy to this day would tell you that that in itself broke her heart which I feel never ever healed,” he said. Edel said her grandmother’s death was being used as a political football. She added: “As we walked along from Longtower chapel, down past where we used to live in Ardfoyle where Peggy brought us up, everybody on Bishop Street came out and blessed themselves. “We didn’t go through any contentious areas, it wasn’t about that. It was about honouring my granny and the suffering that she’s gone through all these years. But there was fury when the PSNI, apparently goaded by unionist criticism, carried out searches at the dead woman’s family home, as well as at the home of independent republican councillor, Gary Donnelly, who was at the ceremony. The PSNI’s actions contrasted sharply with their handling of the loyalist paramilitary funeral of senior unionist paramilitary figure Colin ‘Bap’ Lindsay, which also took place last week with similar trappings. On that occasion, the PSNI press office worked on behalf of the UDA to discourage media from attending the funeral of their commander. A request issued through the PSNI press office on Thursday urged the media to stay away “to respect the privacy” of the family. In 2009, the PSNI also controversially assisted the funeral of William Moore, one of the infamous UVF ‘Shankill Butchers’ who slaughtered dozens of innocent Catholics with meat knives and hatchets.